PT-MZ670 Series meets market demand for high brightness visual technology – combining the affordability of 3LCD with the long-term cost savings of SOLID SHINE laser. 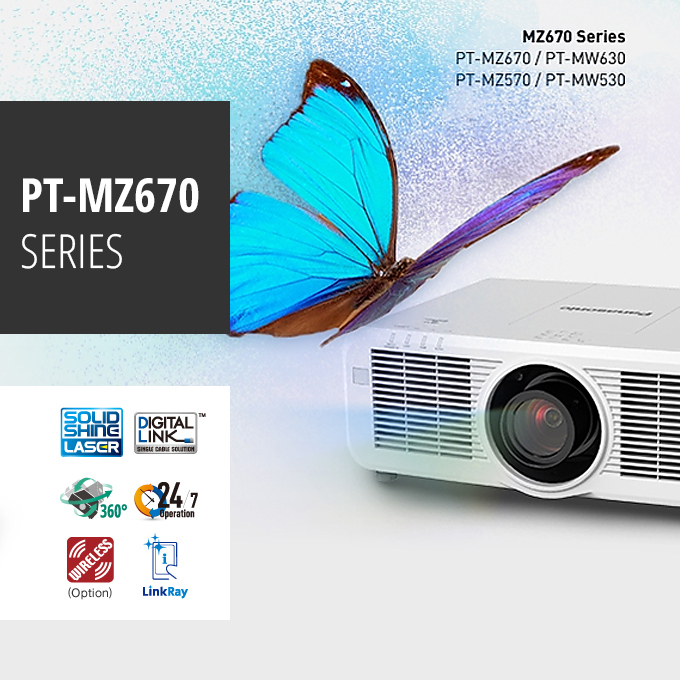 Panasonic is set to unveil the innovative PT-MZ670 Series of installation projectors. The new range is designed to meet the needs of modern classroom and meeting room environments – fostering collaborative working and learning for corporations and educators, while supporting lower total cost of ownership through streamlined installation and operation, and reduced maintenance tasks. The new projectors are ideal for ceiling-mount single-screen applications in small- to mid-sized meeting rooms, classrooms, and lecture theatres. The PT-MZ670 Series delivers brilliant high-contrast images in bright environments; offers single-cable DIGITAL LINK video/control for simpler installation; and strong wireless support for fast connection and collaboration. The Series is Panasonic’s first 3LCD range to feature its acclaimed SOLID SHINE Laser technology, and comprises four compact 3LCD lens-interchangeable models: the PT-MZ670 (6,500 lumens ANSI) and PT-MZ570 (5,500 lumens ANSI), both with WUXGA resolution, and the PT-MW630 (6,500 lumens ANSI) and PT-MW530 (5,500 lumens ANSI) with WXGA resolution. Conventional lamp projectors have tended to be ‘maintenance heavy’, requiring regular attention by technicians to keep them operating at full efficiency. For high usage and critical applications, lamp-free laser projectors like the PT-MZ670 Series are ideal, delivering 20,000i hours maintenance-free operation with brilliant, high-quality images. 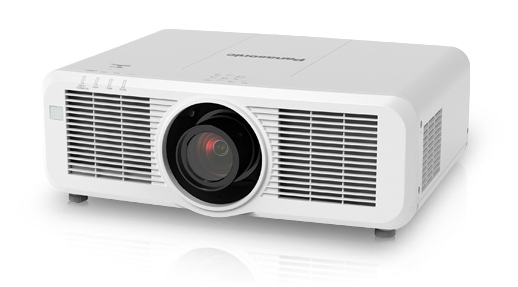 The new 3LCD laser projector Series ensures crisp and vivid picture quality, combined with 3,000,000:1 Dynamic Contrast to display text, graphics, and video images with amazing clarity. Picture-enhancing technologies deliver brilliant images in environments ranging from bright classrooms to corporate meeting rooms with dim lighting. Support for wireless projection is becoming the standard for BYOD meeting rooms. An optional wireless module (ET-WM300) adds a wide range of collaboration technologies which allow users to project wirelessly from multiple devices, present without a PC, and network and stream content securely with PIN protection. These functions make the PT-MZ670 suitable for student presentations, interactive lectures, training, brainstorming and other collaborative meetings. 5 GHz/2.4 GHz mirroring ensures smooth peer to peer media transmission via Miracastii compatible devices. A new ‘plug and share’ wireless feature is also included. This means that using a USB memory device, users can copy configuration data and a lightweight app from the projector to a PC. This enables the sharing of content from the PC, with no additional software or network set-up. In addition, the Panasonic wireless projector apps and manager software have been refreshed, enabling collaborative working among teams from any device that supports the wireless projection. Moderator Mode and Cut-in Function facilitate exclusive, curated or open collaboration from up to 10 wirelessly connected devices. The PT-MZ670 Series is an ideal choice for trouble-free ceiling-mounted projection as it features a dust-resistant cabinet with an improved optical block and filter to reduce dust intrusion and extend life; and a one-way airflow duct incorporating a washable ECO Filter that requires no maintenance for up to 20,000iii hours. DIGITAL LINK-ready capability enables the PT-MZ670 Series to be connected to a DIGITAL LINK switcher using a single cable that reaches up to 150m, making installation simple and flexible. Using the previous range of lenses for EZ projectors further reduces the upgrade cost, and with the powered lens shift function, there’s no need for a ladder when adjusting the lens or zoom/focus. Geometric adjustment provides projection onto curved or specially shaped screens. Ultra-low noise operation of 28dB in Eco mode allows the audience to focus on the presenter with no distractions. The new Series will be available from specialist Panasonic projector distributors and resellers. For further information, please visit www.panasonic.com.au. i For anticipated usage in offices and schools. Estimated maintenance time varies depending on environment. ii Miracast is a trademark of Wi-Fi Alliance. iii For anticipated usage in offices and schools. Estimated maintenance time varies depending on environment. v Not including protruding parts. The Panasonic LUMIX G9 has been created to truly inspire the enthusiast photographer, with a stellar lineup of best-in-class features that deliver incredible responsiveness, stunning image quality, precise operability and outstanding mobility. 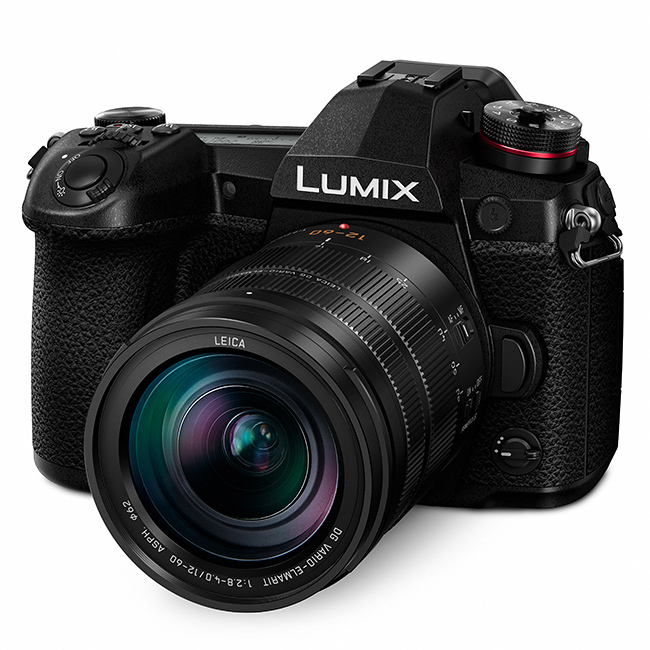 Panasonic continues to be the leading driver of innovation in the mirrorless category with the LUMIX G9. The camera delivers fastest-in-class burst shootingi at 20 fps (AFC) / 60 fps (AFS) in 20-megapixel resolution; introduces 6.5-stops compensation via enhanced, ultra-precise stabilisation technology (5-Axis Dual I.S. 2); and leads the industry with 80-megapixel High Resolution mode. The G9 has breathtaking ergonomics. At 0.83x (35mm camera equivalent), the magnification ratio of the Live View Finder (LVF) is the largest in its classii. This OLED LVF display has a high 120 fps (frames per second) refresh rate with no blackoutiii, key to shooting high-speed action. A status LCD on top of the body – also largest-in-class – provides detailed settings at a glance. Travel photographers will appreciate the introduction of USB charging and operation on this model. Photographers also benefit from features first seen on the LUMIX GH5 and still unique in their class – including 6K Photo Mode burst shooting with no buffer limit, supported by high-speed backup with Dual SD UHS-II Card slots. The LUMIX G9 is designed to capture the defining moment. It boasts outstanding performance with fastest-in-class burst shootingiv at 20 fps (AFC) / 60 fps (AFS) in 20-megapixel full resolution including RAW. A blackout-free LVFv means the user can continuously track and keep the subject in focus. Panasonic has also introduced a new Pre-burst shooting mode on the G9, so the camera commences shooting 0.4 seconds prior to shutter release, including when shooting in RAW. Panasonic allows the photographer to make the most of these high-speed capabilities with 6K Photo, recording a burst of 18-megapixel still images continuously at 30 fps with no buffer limit. The camera also incorporates 4K Photo, capturing 60 fps in 8-megapixel resolution. In 6K/4K Photo, three modes can be selected depending on the situation: 6K/4K Burst, 6K/4K Burst (Start/Stop) and 6K/4K Pre-burst. Contrast AF with DFD (Depth From Defocus) technology has been further advanced, with the G9 able to achieve an industry-leading AF of 0.04 secvi (approx.). The camera’s high processing performance also allows it to incorporate Deep Learning technology (in addition to the conventional Face/Eye Recognition) – which detects the human body and is intended for action and sports photography. Panasonic’s Dual I.S. 2 technology combines 5-axis internal stabilisation with the optical image stabilisation in selected lensesvii. It has been enhanced in the G9 with a new algorithm, and can now support up to 6.5 stops of image stabilisationviii – enabling shooting still subjects handheld at much slower shutter speeds and ISO values. It even allows shooting at ultra-telephoto focal lengths handheld up to 800mmix (35mm equivalent), so photographers can capture amazing wildlife and landscape images. The new algorithm precisely calculates shake information from the gyrosensor, image sensor and accelerometer sensor for highly accurate shake detection and compensation, in particular for low-frequency movement. Panasonic has optimised the G9 sensor for magnificent photography. The new High Resolution mode produces an 80-megapixel equivalent (10368 x 7776 pixels) RAW and/or JPEG image by automatically taking and combining 8 consecutive images in-camera. Designed for tripod shooting – such as landscapes – this provides amazing ease, detail and flexibility, allowing photographers to create very detailed scenes and large prints from their images. At the heart of the camera, the 20-megapixel Digital Live MOS sensor (without Low Pass Filter) and the high-precision Venus Engine processor – provide incredible detail, outstanding low-light performance and impressive dynamic range. The Venus Engine has a number of technologies that are designed to deliver a stunningly natural image. Multipixel Luminance Generation ensures that even the pixels on the edges of images are precise without false colours. Three-dimensional Colour Control balances hue, saturation and brightness for rich colour reproduction from dark to light. High Precision Multi Process Noise Reduction both identifies noise and preserves detail, supporting low-light shooting at ISO 25600. The LVF was a key focus of Panasonic’s innovation when developing the new camera. It combines high speed and high magnification with carefully considered practical features – switchable magnification, Night Mode and AF Point Scope, designed to provide both comfort and excellent results in the field. The LVF – with industry-leading approx. 0.83x magnification ratio and a 3,680K-dot OLED (Organic Light-Emitting Diode) display – has exceptional visibility. The fast refresh rate, free from blackout even in high speed burst shooting, is absolutely essential for action photography. The high-speed OLED technology delivers a smooth 120 fps display, a minimum time lag of less than 0.005 sec and an exceptional 10,000:1 high contrast ratio. The magnification ratio can also be switched to 0.7x and 0.77x. No other mirrorless camera offers this, and it is an excellent feature for glasses-wearers, who can adjust the magnification in order to see the full frame. Night Mode can be selected to put a red cast over the viewfinder and/or the LCD display. Red light does not affect the photographer’s vision when shooting night scenes and astrophotography, and does not disturb wildlife, making it easier to capture shots at night. AF Point Scope is a brand new feature on the G9 for wildlife subjects. When shooting with a long telephoto lens with a shallow depth of field, confirming the correct focus point is crucial. While using autofocus, the user can now zoom in on the LVF or LCD screen, check the desired focus point in detail, and confidently take the shot. A staple of pro-level cameras, the status LCD on top of the G9 body is the largest in its class. The LCD allows settings to be checked at a glance, convenient for tripod shooting. It can also be used at night instead of the rear monitor to reduce the light emitted from the camera. The 3.0-inch 1040K-dot touch-control rear monitor includes Night Mode, has a 3:2 aspect ratio and uses a pixel structure of RGB (Red / Green / Blue) and White for high visibility in bright sunlight. It has a versatile 270-degree tilting design. A convenient Fn lever at the bottom front of the camera allows users to assign a function such as ‘Night Mode’, and quickly flick the switch to activate when needed. The LUMIX G9 is highly mobile at 579 gramsx, while incorporating a rugged field-ready design. The camera has a magnesium alloy full diecast front/rear frame. Secure construction and sealing for every joint, dial, and button make the G9 not only splashxi and dust-proof but also freeze-proof down to -10 degrees Celsius. Panasonic has introduced USB charging with the G9. The camera can not only be charged via USB, but can also be operated while running off a portable USB power bank, useful for time lapse shooting. For the action photographer that needs to backup data while shooting, the high-speed Dual SD UHS-II Card slots provide the flexibility and protection of simultaneous recording to both cards. Field work is also streamlined with Bluetooth 4.2 Low Energy connection and secure 5GHz Wi-Fi® (IEEE 802.11ac), providing convenient remote control and sharing with other devices, and faster data transmission. The Battery Grip (DMW-BGG9) is weather sealed, enables a second battery to be used and replicates the main camera controls for portrait shooting convenience, including the joystick. An Eyecup (DMW-EC4) is available to block light falling on the viewfinder and for greater comfort. The G9 will be available in Australia in January 2018 from photographic specialists and consumer electronics retailers. The accessory Battery Grip and Eyecup will also be available from January. For further information, please visit www.panasonic.com.au or call 132 600.
iii In 20 fps (AFC) / 60 fps (AFS) setting. v In 20 fps (AFC) / 60 fps (AFS) setting. vi In 1-Area AF, at wide-end with H-ES12060 (CIPA) in LVF120 fps setting. Contrast AF with DFD works only with Panasonic Micro Four Thirds lenses. vii 5-Axis Dual I.S.2 can be used with the following lenses as of November 8 2017. A firmware update may be required. H-FS14140, H-RS100400, H-ES200, H-ES12060, H-HSA12035, H-HSA35100, H-FSA45200 and H-FSA100300. viii Based on CIPA standard [Yaw/Pitch direction: focusing distance f=60mm (35mm camera equivalent f=120mm), when H-ES12060 is used. xi Splash Proof is a term used to describe an extra level of protection this camera offers against exposure to a minimal amount of moisture, water or dust. Splash Proof does not guarantee that damage will not occur if this camera is subjected to direct contact with water. First LEICA DG large-diameter ultra-telephoto fixed focal length lens boasts sharpest ever image quality from corner to corner in the history of LUMIX digital interchangeable lenses. 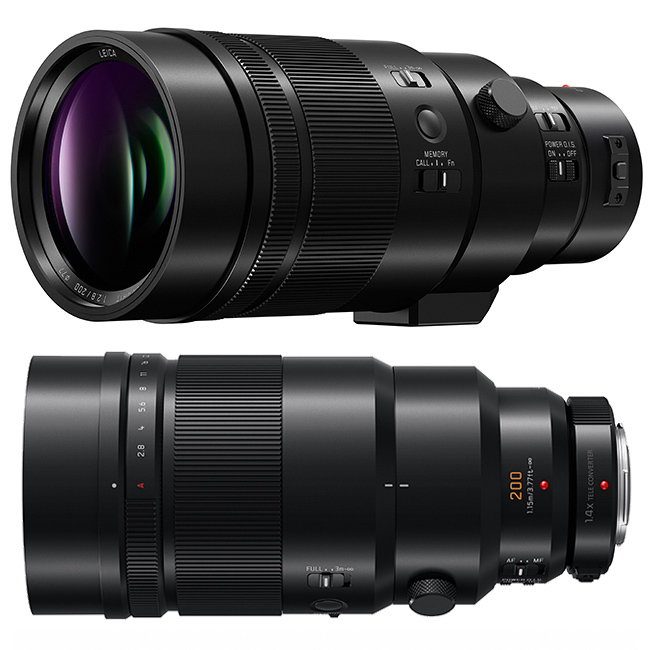 Panasonic has announced the introduction of a new telephoto single focal length lens, the LEICA DG ELMARIT 200mm / F2.8 / POWER OIS (35mm camera equivalent: 400mm). This ultra-telephoto lens offers outstanding high speed and low light performance in a lightweight design. The lens achieves stunning results for action photography, while still attaining compact mobility at a 200mm focal length – unheard of in other camera systems. For even greater versatility, a bundled 1.4x Teleconverter extends focal length to 560mm (35mm equivalent). The H-ES200 has a rugged dust and splash-proofi design for field use and is freeze-proof down to -10 degrees Celsius. The new lens, in stylish metallic black, will be available in Australia in January 2017, priced at $4299RRP from photographic specialists. The highly mobile lens supports handheld ultra-telephoto shooting. With its 400mm ultra-telephoto focal length and stunning descriptive performance, the H-ES200 is suitable for wildlife or sports photography. A 1.4x Teleconverter (DMW-TC14) is bundled with the lens; and the H-ES200 can also be used with the optional 2.0x Teleconverter (DMW-TC20) to extend focal length to 800mm (35mm equivalent). The fast F2.8 aperture captures rapidly-moving subjects, while the Power OIS (Optical Image Stabiliser) compensates for hand-shake to enable shooting without a tripod and in low-light situations. For powerful stabilisation, the lens works with Dual I.S.ii (Image Stabiliser), and the Dual I.S. 2iii system when mounted on compatible Panasonic LUMIX DSLM cameras. The lens incorporates 15 elements in 13 groups, including two UED (Ultra Extra-low Dispersion) lenses. These lenses and Panasonic’s cutting edge optical technology achieve high-resolution, high-contrast imaging from corner to corner while suppressing distortion and chromatic aberration. Incorporating a triple linear motor system, the LEICA DG ELMARIT 200mm / F2.8 / POWER OIS is compatible with the LUMIX G sensor drive at 240fps to take advantage of the high-speed, high-precision Depth From Defocus (DFD) focusing system. This stunning AF performance supports the precise focusing required for 4K video. i Splash-proof is a term used to describe an extra level of protection this lens offers against exposure to a minimal amount of moisture. *Some functions of the H-ES200 cannot be used with the DC-GH5. The firmware allowing the DC-GH5 to fully comply with the H-ES200 is scheduled to be released by the end of December 2017.